Ball Aerospace has completed integration and performance testing of the Cross-track Infrared Sounder (CrIS) that will fly aboard NASA's National Preparatory Project (NPP) weather satellite. 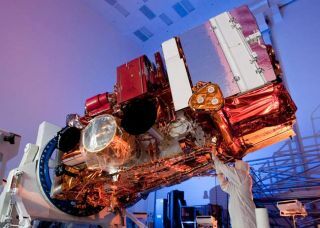 Thenext U.S. weather satellite hasreceived its final observing instrument and will begin pre-launchenvironmentaltesting in October, NASA announced last week. Thelast of the NPOESS PreparatoryProject's five weather sensors arrived at Ball Aerospace andTechnologies Corp.in June and was integrated on the satellite July 14, Ball said in astatement. NPPis scheduledto launchin October 2011to replenish a fleet of polar-orbiting weather satellites operated bytheNational Oceanic and Atmospheric Administration. TheCross-track Infrared Sounder, orCrIS instrument, was the final NPP payload bolted to the spacecraft atBall's satellitefactory in Boulder, Colo.
CrISwas responsible for an NPP launchdelay from January to October 2011 after engineers discovered a voltageissuewith electronic components. The sensor was manufactured by ITTGeospatialSystems. "Successfulintegration of CrISbrings us one step closer to launching the nation's critically needed,next weathersatellite,"said Cary Ludtke, vice president and general manager for Ball's civilandoperational space business unit. CrISwill measure vertical profiles ofatmospheric temperature and water vapor. Developmenttroubleswith NPP's instruments have caused other delays. The Visible InfraredImagerRadiometer Suite was responsible for previous schedule slips, but itwasdelivered to Ball in January. NPPwas originally conceived as a NASAtechnology demonstration mission for the next generation of polar-orbitingweather satellites.But lengthydelays of the National Polar-orbiting Operational EnvironmentalSatelliteSystem, or NPOESS, constellation thrust NPP into a much-neededgapfiller roleto bridge between the current fleet and the next program. TheWhite House terminated the NPOESSprogram in its fiscal year 2011 budget request in February after theprojectedlife-cycle budget soared to more than $15 billion. NPOESS was jointlymanagedbetween NOAA, NASA and the Air Force, which also operates its ownweathersatellites. NOAAannounced in June that the JointPolar Satellite System, the NPOESS replacement program, would startoperationsin 2014 with a clone of the NPP spacecraft. "Withan NPP bus that has alreadybeen built, with the instruments nearly all integrated, and with thegroundsystems prepared to support to NPP, that approach was the lowest risk,"Mary Kicza, associate administrator of NOAA's satellite and informationservice,said in the June 28 announcement.